你好! Long time fan from US, first time comment. Do you use Filo pastry sheet or the Puff pastry sheet? Thanks for everything. Your recipe rocks. I used puff pastry sheet. Great texture. My daughter has made this dessert for a several times. It won't fail in any way. Hi Christine... this is perfect for Christmas parties, you always have solution for me when I need fresh idea to "bring a plate". Yes, 幼砂糖 is caster sugar. I've seen "vanilla sugar" in woollies, but they are quite expensive for a small amount. You can add a vanilla pod in caster sugar and store in an air-tight container. Although a vanilla pod is not cheap, its fragrance can be enough to make a whole big jar of vanilla-sugar. I found you'll pay less if you buy vanilla pod at 袁氏 than Woollies. Hmm...mixing vanilla essence with the butter seems to be very creative. Why not? Wow, your Palmiers look gorgeous. Hope everyone at your work place like them. And your lychee ice-cream is so special. What a creative idea! Love it. It's really good news! Good on you! 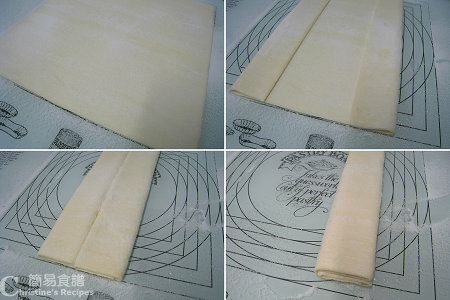 Hi Christine, 請問你是否用Pampas的 Puff Pastry ready rolled ? 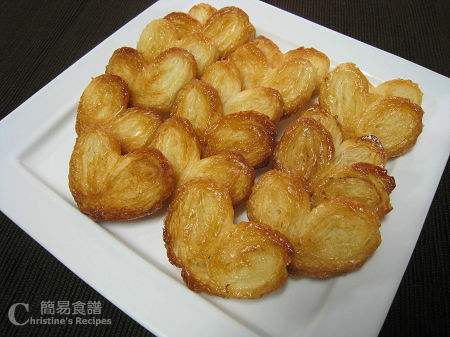 Yes, I used Pampas’ puff pastry for making these palmiers. Very handy! Can I use egg to replace butter? I tried and found it quite oily. Thanks. Yes, you can as long as it's not too wet coz it's very hard to handle. You can even omit the butter and just sprinkle sugar over it. I also can't find the vanilla sugar. but I used vanilla extract instant of vanilla sugar. I put the vanilla extract mix with the butter. It also taste really good. Christine,Thanks for sharing the recipe. My daughter loves it! Thanks for sharing the recipe!! Glad to know your daughter loved it. Happy for you ah !!! So many thanks for your sharing and it's really easy but tasty! However, my 1st time trial is just not crispy enough... is it not dry enough? Bake longer time next time then. Or turn off the oven, let them stay in there for a bit longer until you find them crispy enough. I tried twice just now, and, by the fact that I didn't burn up the whole lot, I call myself quite successful. Haha. However, as I do seek for perfection, or at least anything close to it, I would like to know how to achieve the shining and golden brown appearance like yours. Also, I think mine doesn't taste sweet enough.Should I just sprinkle more sugar? Did you brush butter on top of the palmiers? They would turn shinny. If this doesn't help, brush them with syrup (2tsp sugar + 1tbsp water) before you pop them in your oven. Oh, sorry, forgot to answer your 2nd question. Yeah, generously sprinkle more sugar. I am living in Perth,Australia. If I am not mistaken, you are living in Brisbane right? Can I know where to buy puff pastry in Aust? Did you got it from Coles or Woolworths? I used Pampas puff pastry, picture shown here. Got it from Coles. I think Woolworths stock some too. Hi Christine, I'd like to ask if fillo pastry is suitable for making palmiers? Also, how do I identify 'puff pastry' in the supermarket? 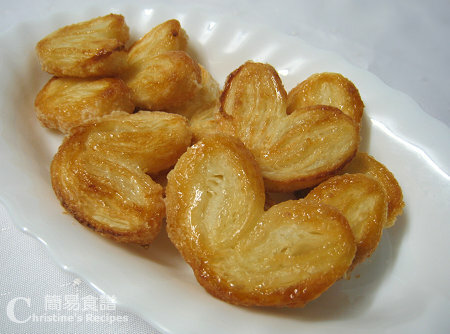 Filo pastry is not suitable for making palmiers, as they are too flaky and easily broken apart. WOW it's YUMMY!!! I just tried a batch down here in Sydney!!! Thanks Christine!!! Love ur simple recipes!!! ADD OIL!!! I translated this recipe into English on my English food blog here. Please hop over to have a look. 是我的酥皮買錯了嗎? 但它明明是 Puff Pastry 來的喔!!! 1. 要唔要焗到十分鐘左右翻轉? 如果唔翻, 十二分鐘就開始轉深色, 有少少燶. 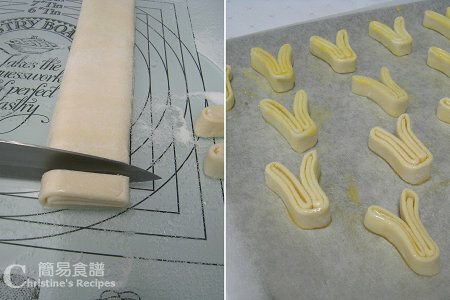 我想問始果買了一block的pampas puff pastry 是否把它搓平即可? 大約要搓至幾mm厚? Hi, Christine. I made this yst.. it is really easy and delicious. Thanks for the recipe so much!!! Christine姐姐, 想問一下, 1. 昨天於超市購買的酥皮, 焗好了, 不一會就轉淋了, 有辦法挽回嗎? Christine, I want to know whether you put them into freezer(-18C) or chiller(+4C), that means that upper part or the lower part of the fridge?Thank you very much for your recipe! You are talented!